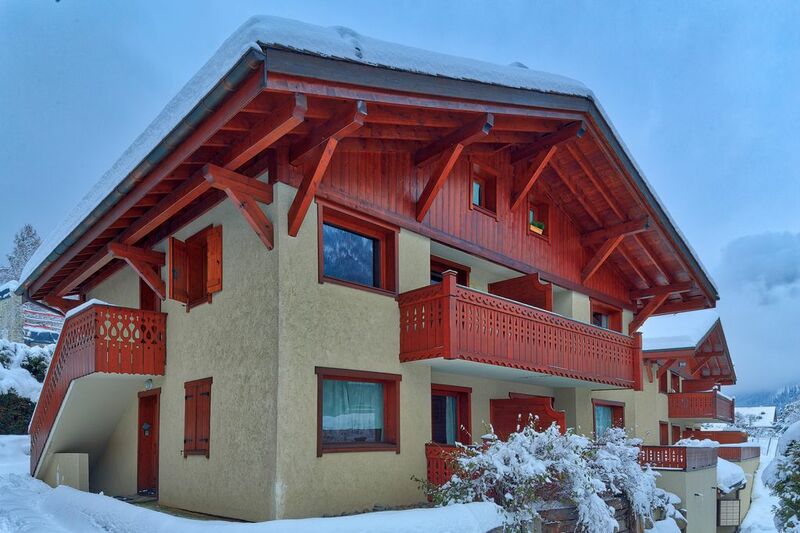 This well presented, sunny, ground floor chalet is in a great location. Finished to a high standard it offers the ideal base for exploring the Chamonix valley. The open plan living room looks out onto Mont Blanc with fantastic views of the Aiguille de Midi. The patio doors lead out on to a south facing terrace and garden area. with one en-suite shower room and one bathroom. The busy town centre in Chamonix is only a 10min walk away, also the train stop and the ski bus stop going to the ski areas are within a one minute walk. There is an underground car parking space and a ski / boot store in the basement. The master bedroom has an en-suite shower room. The family bathroom has a bath with a shower. All are fully tiled and beautifully finished. Subject to availability we can provide cots and high chairs when requested. A daily house-keeping service is available at an additional charge. If you wish to make a booking please call or email with your requested dates, lead name, contact details and number in your party. Chamonix Holidays In-Resort: You will be met on arrival in resort by our concierge partners, they will be on hand during your stay in case of emergencies and your Resort Information Pack is available inside the property. Normal check in is between 4pm and 8pm, and check out on departure by 10am. Prior to arrival, we can organise your airport transfers, lift passes, and equipment hire, so please get in touch with us and ask about our rates. A bus stop at the bottom of the drive and only a 10 minute walk to Chamonix high street. Far enough away from the hustle and bustle but close enough to still be convenient. Great property for a winter or summer holiday. Thank you for the review Greg, we are delighted you had a great time in Chamonix and would love to see you again. There are fabulous walking and running trails all over the valley as well as xc mountain biking and down hiling and unlimited climbing areas for all abilities. Other Activities: All Alpine activities are catered for in the area. Ask us if there is anything special you are interested in I'm sure we can arrange it! Golf: The par 72 golf course is overlooked by some of the highest peaks in the Alps and is next to the Felgere Ski Resort . If you are staying in Chamonix it is a 5min drive or you can take the train or a bus to Les Praz.